A restaurant in Dubai is doing its business a little bit differently by adding a little dose of humanity to it. 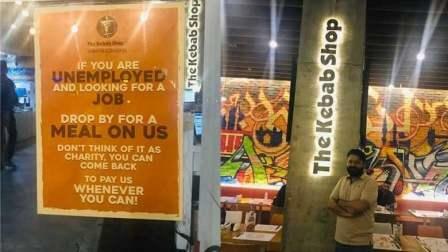 The Kebab Shop, which is located in the Dubai Silicon Oasis has a board outside the shop that is not publicity for food but presents free meals to jobseekers. The board reads: "If you are unemployed and looking for a job, drop by for a meal on us. Don't think of it as charity, you can come back to pay us whenever you can." Some year before the Pakistani-Canadian businessperson Kamal Rizvi, who is the owner of the DSO branch of the restaurant, said there was a happening that controlled to the promotion of this creativity. "We had a pair of customers who would visit us on a daily basis and would have their meals here and spend good time chatting at our restaurant. This was a second home to them. But after some time, I noticed that one of them stopped coming." On questioning, Rizvi found that the man had lost his job and to restriction, his disbursement stopped coming out to eat. "I was sad to hear that and I told his friend to tell him to continue coming here and eating his meals as he used to. I told him don't consider it assistance but deliberate it like a loan and later if he gets a job and wants to pay then he can come back and pay. "He started visiting again and I saw how happy, grateful and full of energy the friends were," said Rizvi. "This led me to think how many more such people would be struggling out there who probably would be even skipping meals to cut their expenditure. I decided that I will start an initiative where such people will be comfortable. That is why I have mentioned on the board that 'don't think of it as charity'. People should not feel embarrassed or feel hesitant to come." A Dubai-resident for nine years now, Rizvi has given stringent commands to his staff to not ask any questions, or for any ID proofs, or paperwork to any customer who wants to avail the free meal. "All that the customer has to say is a point to the board outside and the staff won't ask any questions. The staff will simply ask the customer if he wants a vegetarian or non-veg meal; rice or roti meal. Accordingly, our staff will serve them either biryani or else roti with a curry along with a cold drink." Asked about how much often the restaurant becomes such customers, Rizvi said: "They come randomly, sometimes one or two a day some days we even get a group of three or four friends but mostly they don't come repeatedly. They usually come and sit shyly in a corner of the restaurant and we serve them just like any other customers. Many of them get so overwhelmed that they write thank you notes on paper napkins and leave them on the table." On being asked if any customer has come back to pay back for the meal he had, Rizvi said: "Yes, although very few but people have returned to our restaurant asking us how much they owe us and all we say is give what you feel like because we do not keep record of such service. You can pay us whatever you feel like." Pakistani-Canadian businessperson Kamal Rizvi said there are certain happiness and peace he experiences through this resourcefulness. "It doesn't cost me much by feeding a couple of people a day because Almighty Allah has given me enough to be comfortable and there is a sense of completion and peace I feel when I am able to serve people in one or the other way." Giving out his message of hope to all, Rizvi said: "If even a few percentages of restaurants contribute this way to the society then no one will sleep hungry, no one will suffer a loss, it will only lead to a happier and a healthy society." Rizvi also aims to start something similar in Karachi, Pakistan, where he is looking to connect with restaurants and banquet halls so as to collect the spare food from them, repack it and distribute it among the needy.